1. Melt butter in a large pot over medium heat and add onions. Cook onions and mushrooms until onions are translucent and mushrooms are glossy and smooth. 2. Next, whisk in flour. Cook for a minute more to cook out the floury taste. 3. Stir in beef broth, worcestershire sauce and marsala wine. Bring to a boil. 4. Add frozen meatballs. Return to a boil then reduce to low and simmer for 20 minutes. 5. Stir in sour cream and add salt and pepper to taste right before serving. 6. Serve meatballs and sauce over warm, cooked eggs noodles and top with green onions for garnish. 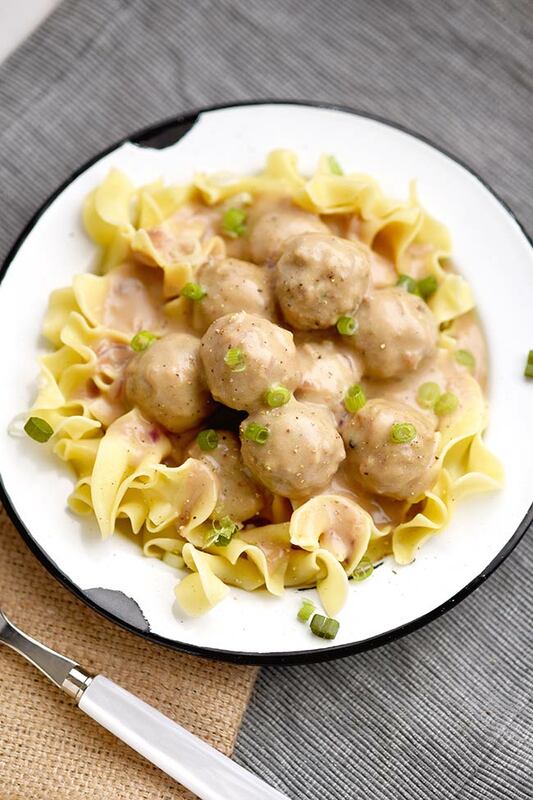 These easy creamy Swedish meatballs with noodles are one of our personal favorite recipes to make for dinner during the week. No trip to Ikea required. This recipe does not use any cans of cream-of sauces. Those cream sauces are super easy to make yourself at home! You’ll end up consuming a lot less sodium and you’ll cut out a lot of junk ingredients if you make your own cream sauce. That’s why I pretty much always make my own. I also oddly enjoy making a roux-based sauce. There’s something about it that’s relaxing. Ha! That sounds weird but it’s true. Once you get the butter+flour+liquid combo down pat, it’s really easy to do and you’ll find it’s the base for most creamy sauces so it’s a good cooking skill to go ahead and learn when you get the time. Yes! I cheat and use store-bought frozen meatballs. I’m honestly not a huge fan of store-bought frozen meatballs but don’t always have time to make them from scratch. If you do, go for it! If you don’t have that kind of time, then you might feel better to know that store-bought meatballs don’t usually have a lot of extra junk ingredients. So it’s a shortcut that won’t be forcing you to sacrifice your health. What kind of meatballs should you use? Ideally you’ll want to use unseasoned, original meatballs. Avoid using Italian-style meatballs if you can. It’s not a deal breaker, but this Swedish sauce will taste better on plain meatballs vs. seasoned ones. You can even use vegetarian “meatballs” or meatballs made with ground turkey if you’re looking for a lighter option. I find that the medium to higher priced meatballs do have better flavor but in this case, the Swedish sauce will overpower the flavor of the meatballs themselves more so than meatballs with red sauce. So you don’t have to worry too much about the quality of the meatballs other than checking the ingredient list and nutrition facts. 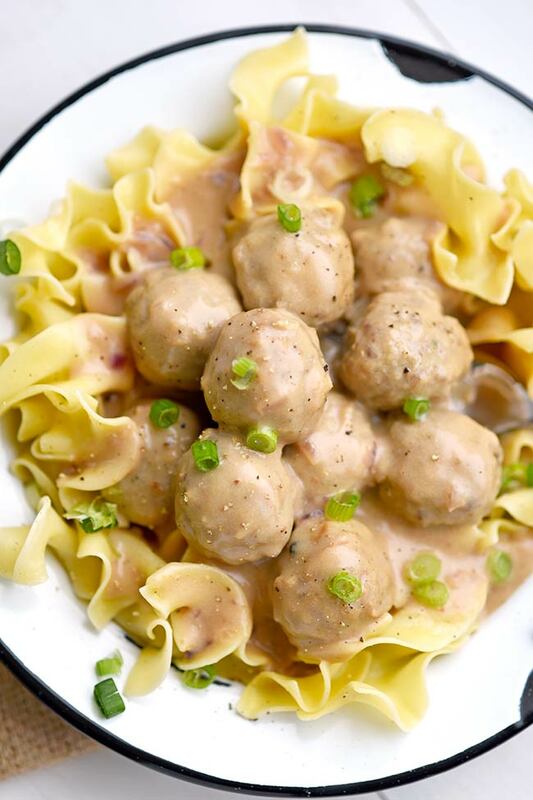 What kind of noodles go best with Swedish meatballs? I like to use no-yolk egg noodles. They’re a little lower in fat and cholesterol than regular eggs noodles and I can’t tell a difference in the taste since I like my noodles smothered in sauce anyway! What are some variations of this recipe to try? 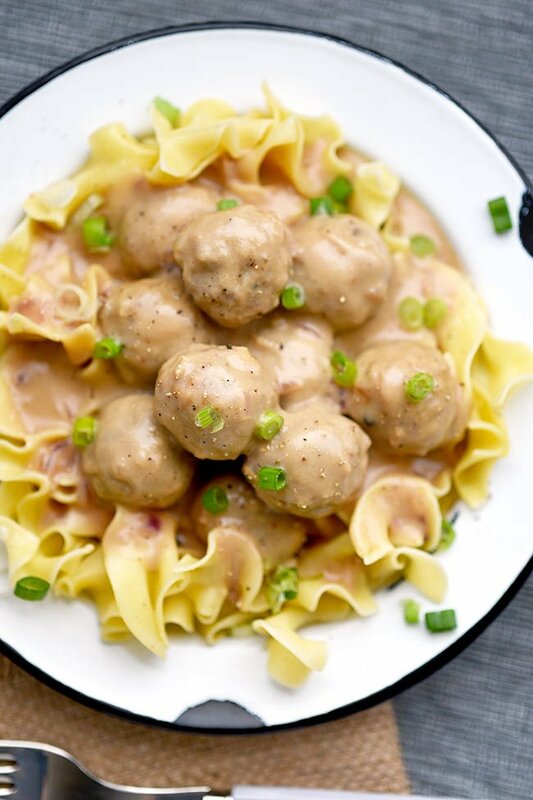 If you’ve made this Swedish meatballs with noodles recipe before and want to try some different flavor variations, try using a different type of wine. Sherry would be good or a dry white wine. You could also try half and half instead of sour cream for a less tangy flavor. If you’re trying to skim calories, try skim milk. It wont be as creamy of course, but it’ll still be tasty! You can also try different colored onions. I made this with red onions but you could also use white or yellow. Experiment and see what you like best or just go with whatever you have on hand! 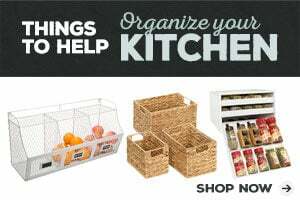 Want more easy weeknight dinner ideas? 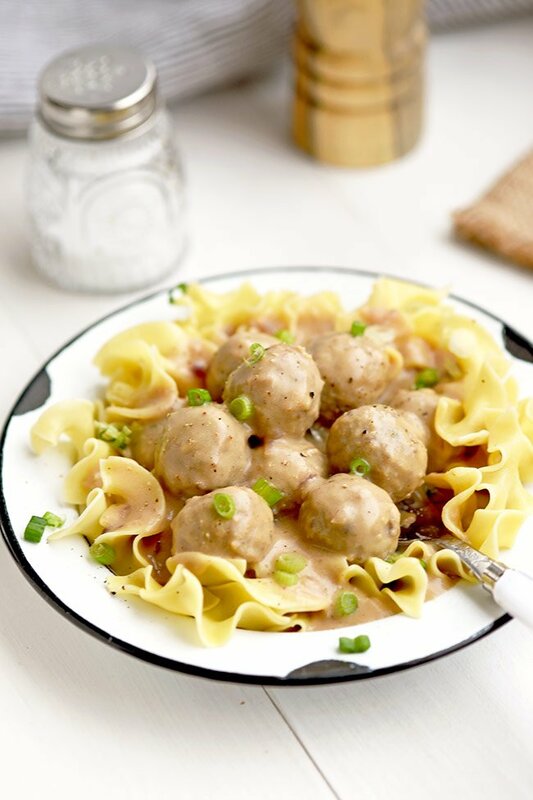 This Swedish Meatballs with Noodles recipe was featured on Menu Plan Monday, Sew It Craft It Cook It and Inspire Me Monday and Wow Me Wednesday!